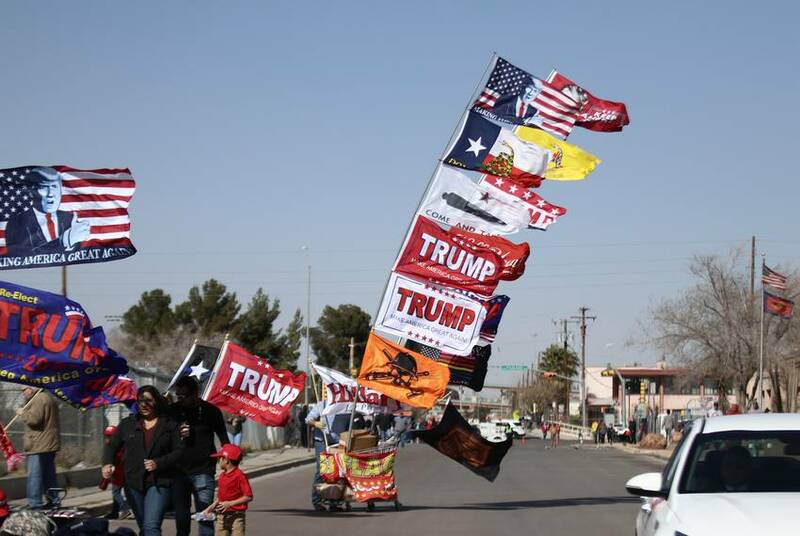 As the president kicked off his re-election campaign and tried to marshal support for his border wall, one of his possible 2020 opponents spoke to thousands across the street in a counter-rally. 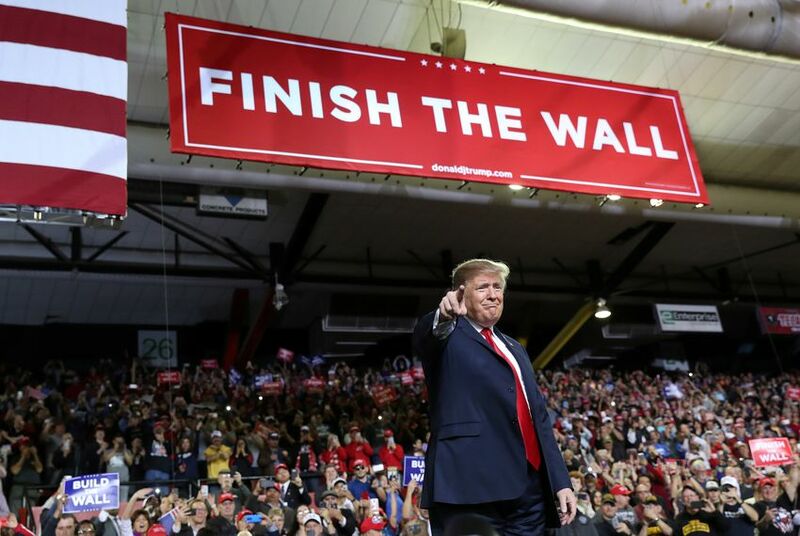 EL PASO — President Donald Trump kicked off his first major rally of the year here the same way he campaigned during his successful 2016 bid: by unleashing a torrent of criticism on the media, pushing back against allegations of collusion with Russia, and promising once more to end illegal immigration and build a wall on the southern border. Across the street, one of his potential 2020 rivals — former Texas Congressman and El Paso native Beto O'Rourke — held a competing rally that drew thousands of people. The rally came as members of Congress reportedly agreed to the terms of a funding deal that would avert another partial government shutdown. Although last year’s breakdown was over funding for Trump's border wall, the impasse this week concerned bed space for detained undocumented immigrants. Trump also repeated dubious claims about the impact that the fencing that runs through several miles of El Paso County has had on violent crime. Local and state lawmakers have pushed back against those claims, citing federal statistics to back them up. From 1993 to 2004, El Paso’s overall violent crime rate per 100,000 residents was higher than the country’s average, according to FBI and El Paso Police Department statistics. From 2005-08 — before fencing was built along the banks of the Rio Grande — El Paso’s violent crime rate fell below the country’s average. It began to rise again over the next four years. Trump supporter Michael Lightbourn said the wall has helped deter crime and that he supported the president’s quest to build more. “Between 2003 and 2005, three of my trucks were stolen,” said Lightbourn, who owns a high-end classic car restoration business. He added that it was ridiculous to label the president a racist for his immigration agenda. “He’s not racist,” he said. “Just look at all the people that are here. And they are black, white and Hispanic." “We can show the rest of the country ... that walls do not make us safer,” O’Rourke said, arguing such barriers force immigrants to cross in more remote, dangerous stretches of the border. Trump loomed large at the O'Rourke rally — both figuratively and literally. As O'Rourke spoke, the president could be seen taking the stage at his own rally on a monitor set up in the parking lot of the coliseum — right behind the park. O’Rourke received a rock star reception during the march, which seemed to include just as many chants urging him to run for president as those against Trump and the border wall. About 7,000 people went to see O'Rourke speak at the park, according to an aide, who cited law enforcement. Fielding reporters’ questions about 2020 along the way, O’Rourke kept the focus on the unity of El Paso in the face of Trump. 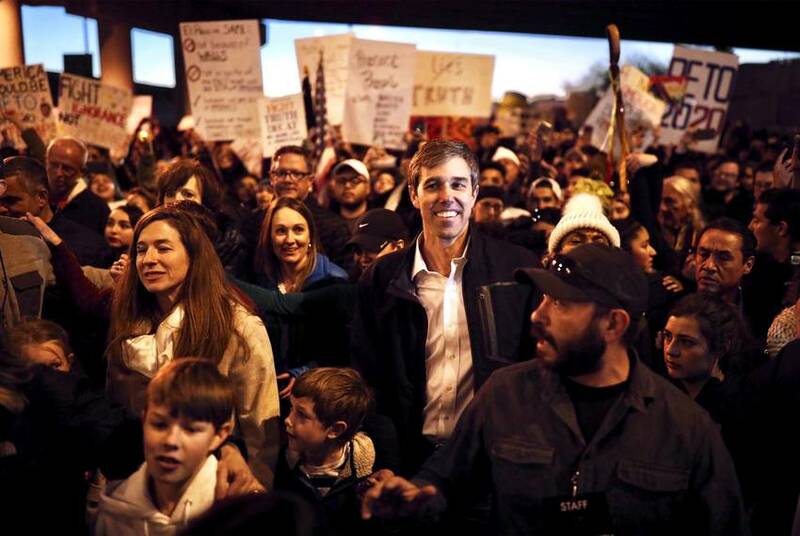 "I'm gonna follow the community’s lead, and that’s what for me tonight is all about, nothing less and nothing more," O'Rourke told reporters on a conference call hours before the march. Inside the coliseum, Trump rarely referred to O'Rourke by name but repeatedly mentioned his close loss last year to incumbent U.S. Sen. Ted Cruz, R-Texas. "They’ll say Beto O’Rourke had a wonderful rally of about 15 people [tonight]," he said. At one point, Trump said the El Paso Fire Department allowed 10,000 people into the arena although the capacity is several thousand fewer. The El Paso Times reached out to the fire department, and officials there confirmed the president's statement wasn't true. The president was also consistent in his treatment of the media, which he called “fake” and “dishonest” several times. “We have suffered a totally dishonest media, and we’ve won and it’s driving them crazy,” he said, later adding that the media was complicit in covering up for his former rival, former Secretary of State Hillary Clinton, and her fellow Democrats. Before Trump took the stage, Cruz spoke to the crowd and repeated the line about the success of El Paso’s barrier before retelling the immigration story of his Cuban father. “There is a right way to come to this country, which is you stand in line, you follow the rules and you come here seeking the American dream,” he said.